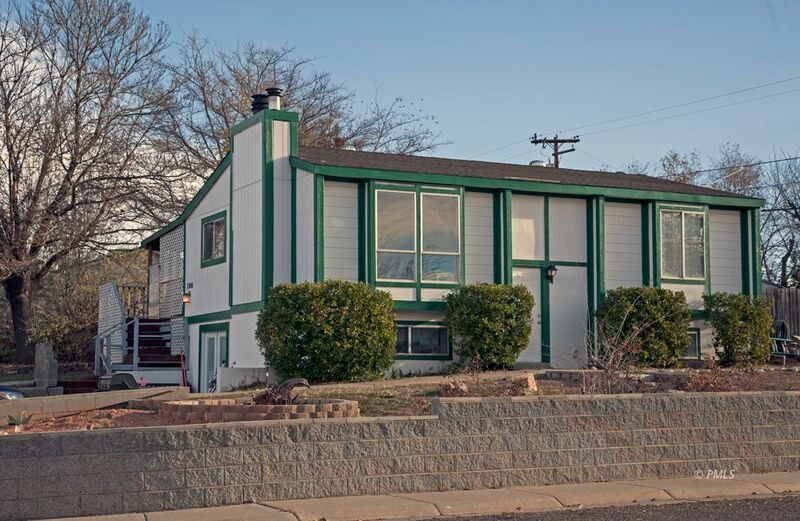 This lovely home in Page Arizona on Date Street is close to Lake Powell in an established neighborhood. With large rec room and wet bar in the basement this home would be great for entertaining friends and family, a VRBO or B&B. Home features 2 bedrooms up and 2 bedrooms down, several common living areas and a wood burning stove downstairs. This split level home has hard wood and tile floors, stackable washer and dryer, ceiling fans, and a fire place. At .25 acres there is plenty of room for recreational toy storage or a full garden. Recent remodel includes a new roof in November 2018, a less than six month old water heater, new high-end stackable washer and dryer less than a year old, newer French Door Refrigerator, new downstairs sump pump less than a month old, refinished hard wood floors upstairs. New wood like tile downstairs as well as refinished ceilings and drywall. Add all of this together and you have a move in ready home waiting for your family or as a vacation rental. The backyard is fully fenced with a storage shed, garden area, and a mature apple tree.